The average low total return forecast for Value Line’s Issue 3 is 6.6%, dwelling below the group average (7.2%) of all of the companies in the Value Line Investment Survey. And while you’re brushing up on your French, take note that the long-term low price forecast for Blackberry (BBRY) ratcheted up from $7 to $14 this week. To all you doubters and haters of the company-formerly-known-as-RIMM, you might look up pendulum in your French dictionary. How do pendulums fit when it comes to deep value speculation? 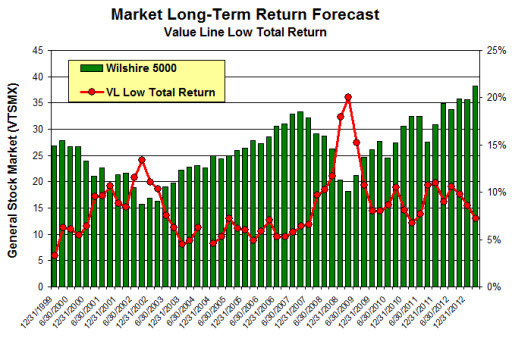 The Value Line low total return forecast held steady at 7.2%, staying at last week’s levels. We might think of it as another log on the market barometer fire, but Chicagoland Conference keynote speaker Chuck Carlson offered up one of his favorites for the audience to consider. He tracks the percentage of stocks above their 200-day trailing average as an indicator to get either (1) more cautious in a frothy market or (2) more adventuresome while everybody else runs for the hills. This graph is published in Investor’s Business Daily but it’s also available for FREE and at your fingertips at any time by graphing $NYA200R using www.stockcharts.com as shown here. During the depths of the Great Recession the percentage of stocks trading above their 200-day trailing average dropped under 2%!!! See circled area on the multi-year chart. When everyone else panics, study your companies carefully and find your wallet. At the opposite end, spending some time above 80% or 90% can portend a correction. We’re currently hovering near 80% and vulnerable to a correction at the present. Chuck Carlson is a community favorite and long-time champion/advocate for individual investors and what we try to achieve. We’ve featured his Dow Theory and low cost investing work often over the years. And in Chicago, we got to see him respond to a devastating case of laryngitis — nearly rendering him without a voice. But the show must go on and it did … Chuck delivered to an appreciative gathering of long-term investors. Thanks, Chuck. Mark, Thanks for this info. Nice especially to have a recap about what Chuck Carlson said about 200MDAs at the meeting.